When our son Jim was 3 years old he nearly died of complications from his mitochondrial disease. We were so grateful that shortly after this frightening period the Mitochondrial Research Guild was formed and Dr. Saneto was brought to Seattle. At that time we finally received a firm diagnosis and viable treatment plan for Jim for both in and out of the hospital. Now Jim’s disease is controlled with a complex vitamin cocktail given twice daily, with a special diet and continuous sensitivity to his energy limitations. Jim has only had to be hospitalized 3 times in the last 10 years, where prior to beginning treatment with Dr. Saneto, we questioned if he would ever see Kindergarten. His disease manifests itself in neurological (mental, vision, speech) and physical (fine and gross motor and GI) developmental delays that require constant attention and therapy, but he is bright and interested in facts about people and things. Jim is in a Transition Program (special ed) in the Lake Washington School District. Jim attended his last year at Camp Korey this summer after six joy-filled years of excitement and anticipation. 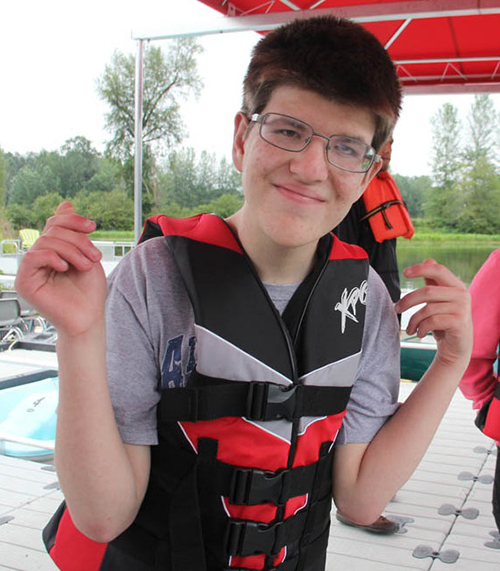 Jim deals with a lot of anxiety and physical and developmental limitations, but at Camp Korey he has been given courage and the encouragement to try so many things he would never do otherwise, like riding horses and doing the zip line. He has managed to endear himself to several of the counselors and members of the family at Camp Korey because of his love for people, knowing their history and history of the Camp property itself. He remembers his cabin mates and counselors from 2009 and every year since. One of his very first counselors came and visited him at dinner one evening this year when he found out which week Jim was attending. This year his counselors got together on the last night of camp and made Jim a surprise photo album with first names of all the counselors and campers by cabin and pictures of him doing all the activities that he was brave enough to do. Our favorite thing is the day we go and pick him up from camp. Although his is exhausted, he is happy, confident and so “grown up.” We love the wonderful stories the counselors and staff tell us about Jim’s week that he can’t tell. We are very grateful for all that Camp Korey has done to support Jim’s growth and development for one week every summer and to support our family and introduce us to other parents dealing with similar issues at Family Camp every year. Camp Korey, and the support we receive from other families and the staff at Seattle Children’s are helping us give Jim a full and happy life. It has made us all better people and a stronger family.